I'm a firm believer that you should stick to a registry when you're buying a gift for a wedding. The couple didn't go to the store for a handful of hours, plus countless time editing and adding online, for you to just pick some random item at the store that you think they would like. Chances are if they would have liked it, they would have registered for it. So instead of giving some amazing gift that the couple missed, you're giving them a trip to the store to return it. The exception, of course, is very sentimental or personalized gifts that the couple was unable to register for. The company engraves boxes that you can use to store bottles (I'm talking more wine and alcohol rather than soda bottles). You can choose ones that are engraved specifically for the wedding party (with words like The Maid of Honor or The Parents of the Groom etched in) or ones for a couple. These are gorgeous. 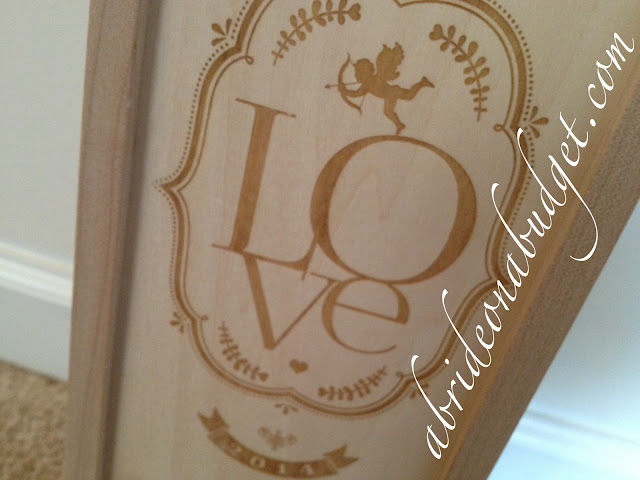 You can choose from designs like "my love" to couples boxes with two attached bearing words like, "you & me". And the love ones are absolutely perfect for a couple, especially since there are ones that you can etch with a couple's name and wedding year. The box comes with scrunched paper inside, which you can use as a bed for your bottle (and it helps it from potentially breaking). To use it, you slide the cover off, place a bottle inside, and close it. Simple. To make it even easier, there's an indent in the top of the box that aids in opening it. Even on the first open, it slid very easily. When I got the box in the mail, I was so surprised at how beautiful it was. The craftsmanship is really amazing. I was expecting there to be shavings all over. Honestly, I thought there might be shortcuts taken because the boxes aren't incredibly expensive. 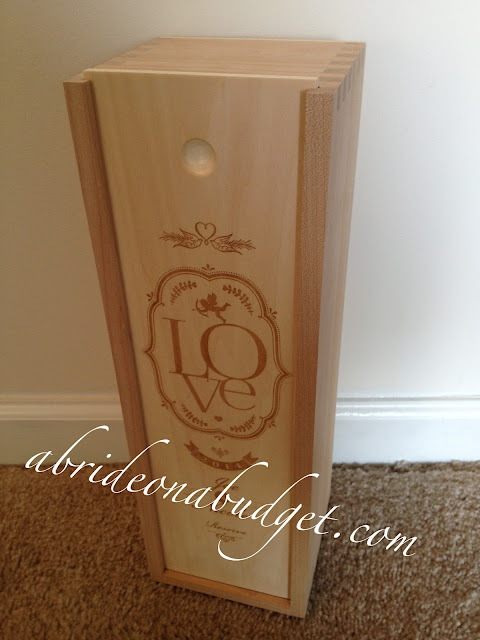 The Love Reserve box that's pictured in this post is an affordable $49 and that includes engraving. Speaking of engraving, you can actually engrave a personalized message on the inside of the box. 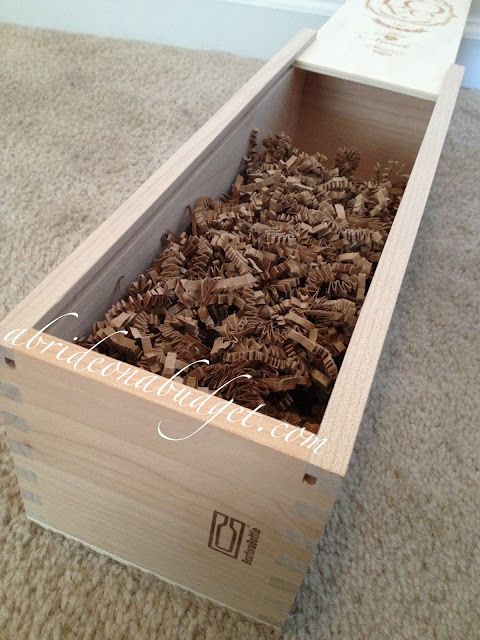 What a sweet way to make this keepsake one that the recipient won't throw out. The boxes start at $35 and range to $99 for a holiday three-pack. The one I have my eye on right now are the ones that say, "It's a boy" or "It's a baby" followed by "you're probably gonna need this." We have a few friends who are pregnant at the moment and that would be perfect for them. Truth is, these are perfect for everyone. Even if you have a friend who doesn't drink alcohol, this is a great gift. You can just put a bottle of sparkling cider in it. I've never seen something like this before, so this is definitely unique and a gift that will be very well received. 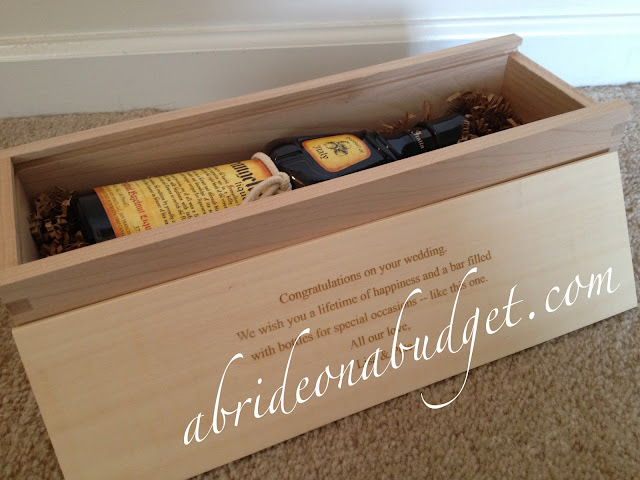 BRIDAL BABBLE: If someone gave you this as a gift, what would you want to be inside? Have a friend who loves wine? Check out our For The Wine Lovers gift idea. so beautiful! and dresses up the wine so much! I would want a nice aged scotch in it.